The 100th fought in six major campaigns from their arrival in Italy in September 1943 to the end of the war in May 1945. Naples-Foggia Sept. 22, 1943 – Feb. 11, 1944: Attached to 34th Division, 100th lands at Salerno and fights a series of battles as it pushes inland, crossing Volturno River three times. Toughest battle is at Mount Cassino. 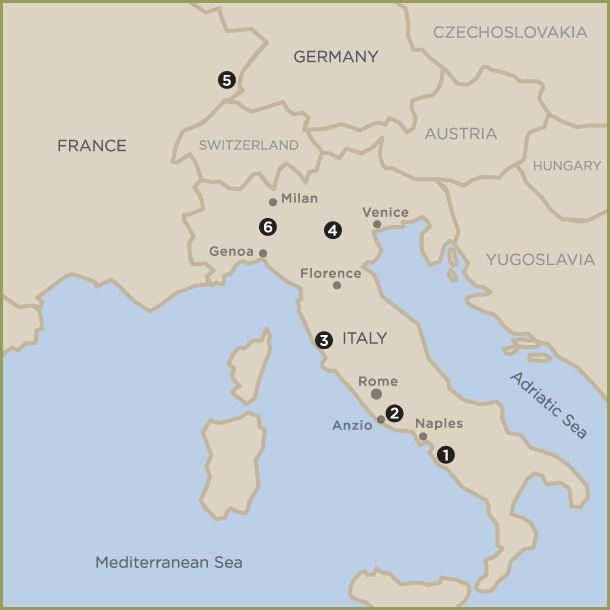 It takes Allied forces four major assaults and four months to take Cassino. By Feb 1944, 100th has suffered so many casualties, it is called “the Purple Heart Battalion.” Cassino marks end of original contingent of 100th. Only 520 out of 1300 who arrived in Italy are still fit for combat. Anzio Mar 26 – June 2, 1944: 100th lands at Anzio, participates in breakout from beachhead, spearheads drive and capture of Lanuvio, last major German stronghold on road to Rome. Following week, 100th meets up with newly arrived 442nd RCT at Civitavecchia, Italy. Rome-Arno River June 21 – Sept 4, 1944: First combat experience for 2nd and 3rd Battalions of 442nd. 100th initially kept in reserve, but sent into battle when the two battalions aren’t making progress. In three hours 100th captures critical town of Belvedere. 100th earns first Presidential Unit Citation. Northern Apennines Sept 10, 1944 – April 1945: 100th assigned to IV Corps, crosses Arno River near Pisa. 442nd assigned to II Corps, crosses river near Florence. As they start to probe German defense – the Gothic Line – both units are pulled out, sent to France. In March 1945, 100th/442nd sent back to help break Gothic Line. Rhineland Sept 29, 1944 – Mar 21, 1945: 100th/442nd engage in heavy fighting in Vosges Mts near German border, liberating towns of Bruyeres and Biffontaine and rescuing the “Lost Battalion.” 100th/442nd sustains more than 800 casualties. 100th is awarded second Presidential Unit Citation for outstanding action during this period. Po Valley April 5 – May 2, 1945: 100th/442nd makes a surprise attack on German mountainside positions, breaking through Gothic Line. Special commando unit is formed, Task Force Fukuda, led by Major Mits Fukuda of 100th. Takes Aulla from fleeing Germans on Apr 25. 100th earns third Presidential Unit Citation for its part in Gothic Line campaign.